All languages evolve over time, but finding how and when certain changes happen is a daunting task for linguists faced with an overwhelming amount of data. Now researchers from the U.S. and the U.K. have used a statistical technique popular in physics to let the computer do the hard work. Their research traces the pronunciation of words over thousands of years, with more precision than ever before. 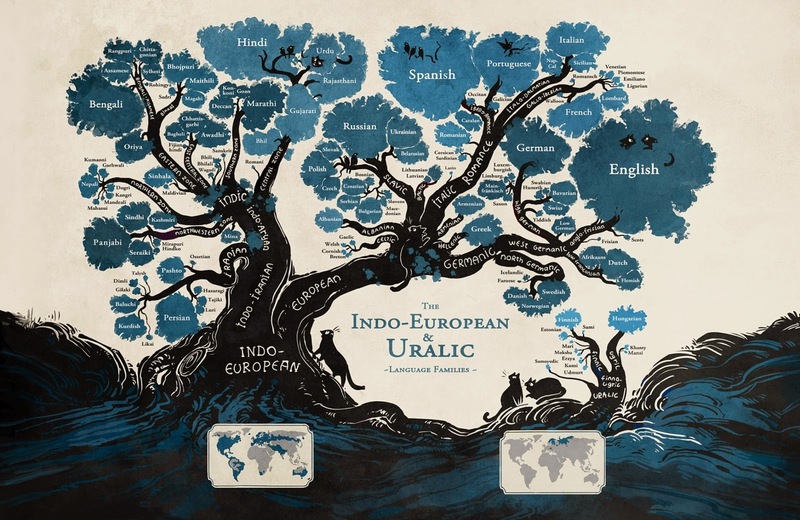 Language tree of European and Uralic language evolution. Not associated with the work by Mark Pagel and Tanmoy Bhattacharya. Credit: Illustration by Minna Sundberg. Available via creative commons from flickr. Led by Mark Pagel from the University of Reading and Tanmoy Bhattacharya from the Santa Fe Institute, this work was published last month in the journal Current Biology. Language shifts often occur because the way a vowel or consonant is pronounced changes in many different words at once. For example, early Germanic languages used a p sound in words like "pater" or "pedis", but this later changed to an f sound creating the more familiar words "father" and "foot". A sound change in many different words at the same time is known as "concerted evolution", and allows linguists to track the history and relationship of languages. From this type of study, a language tree can be constructed, similar to a family tree in genealogy. But for researchers, finding these language shifts in words can be a very tedious task, made more complex if individual sounds within words are studied. "Computers so far have mainly used the presence or absence of words with a common origin in various languages to stitch together trees that describe the descent of the various languages from a common ancestor," said Bhattacharya in a Santa Fe Institute press release. "This has left out the vastly richer data residing in sounds". The researchers say that tracing how sounds change within multiple words is similar to how biologists study changes in DNA gene sequences, which also often occur in multiples. A statistical technique known as Markov chain Monte Carlo is popular among physicists and the researchers used this to write a computer program that does the hard work of tracing sounds for them. Their program takes a large database of historical language sounds and automatically finds the most likely language tree based on the probabilities of individual sounds changing to others. very few transitions between the two groups. "What this means is that the computer can now take over the tedious work of finding these regular changes and reconstructing past languages," said Bhattacharya in an email. This leaves "linguists the fun task of coming up with the hypotheses in the first place" and "interpreting what the language relationships really mean culturally". 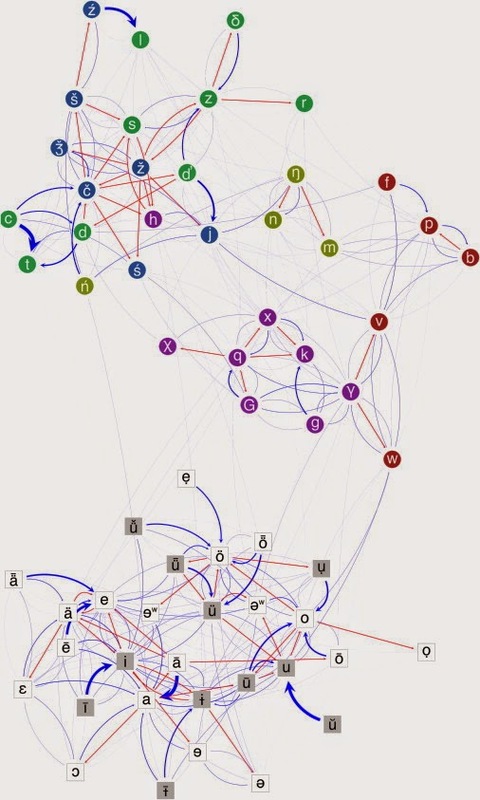 Bhattacharya, Pagel, and their colleagues tested their model on a family of 26 Turkic languages, spoken in Southeastern Europe, the Mediterranean, Siberia, and Western China. Their database of languages spans roughly 2000 years and was converted into 62 different phonetic sounds. Without any input from the researchers (which could bias the results), the computer model found about 74 sound changes that occurred in many different words at once. By placing these changes on a timeline, the researchers built a tree of Turkic language evolution that agreed with previous studies but with far more statistical precision. They also discovered new trends thanks to the rigorous processing power of the computer model. "We found that these changes happen in a roughly clock-like fashion in all the various branches of the tree, something that was not known before our work," said Bhattacharya. They found that a sound changes in multiple words about once every 385 years. "Our new method is another exciting step to understanding how languages and genes evolve," said Pagel in a University of Reading press release. "It will allow us to go back in time further than before, making it possible to reconstruct ancient proto-languages, words that might have been spoken many thousands of years ago". The researchers also suggest that their model can be applied to any field where individual "building blocks" can shift within a larger entity. For example, simultaneous changes within the field of fashion or art might be traced in a similar statistical way to build up evolution trees of dress sense or art techniques. Has anyone established a link between IE and the other major language groups? Over the period of time more research on language evolution here some tremendous facts research traces the pronunciation through different parameter and analyses well. Thanks to the site from where i have got unlimited cheats and generator codes of club penguin for free of cost than visit here.